Two years ago January 30th our youngest granddaughter was born. It was a relief and a joy since the pregnancy for our daughter had been high risk and carefully monitored. Though Cassie went into labor, she ended up needing a C-section. Watching this joyful child grow has been a blessing and a joy. But Cassie’s next pregnancy progressed normally with little of the discomfort, stress or risk of the first one. When Cassie told us the date of her, this time, scheduled C-section, I was concerned only because I felt it might be too close to her due date. Cassie asked if Keith and I would come to take care of Ellery and their little dog Melvin when the baby was born. Of course, we said yes. I had started packing a few things–just in case. Election day was about two weeks before her scheduled c-section. Keth and I voted right after lunch, then got haircuts before heading home. That’s when the first phone call came. Cassie and Kurt were on the way to get Cassie checked out. She wanted us to know but said she didn’t think it was anything. The next phone call assured us the baby was fine. However, Cassie’s blood pressure was fluctuating. They wouldn’t let her return home until it stabilized. Kurt called a while later saying they’d probably be going home. The next call was Cassie. Her words, “Can you come NOW?” Turns out her blood pressure spiked and they couldn’t get it under control. Time to take the baby. We grabbed our suitcases, loaded them up, put them into the car and headed to Omaha. I’d already talked to my friend and neighbor Rachel about watching the house while we were gone as she usually does. She also knew the circumstances. I left her a quick message, “The house is yours.” Keith isn’t one to break the speed limit and I doubt he did that evening, but his foot was a lot more heavy on the gas than usual. By the time we arrived, baby Ezekiel had been born and was fine. Cassie’s blood pressure wasn’t where they wanted it, but she was doing well, too. Kurt had picked up Ellery from Cassie’s friend who sometimes watches her, and had almost two-year-old Ellery in bed by the time we arrived at their apartment. He helped bring in our stuff and get us settled, before heading back to the hospital. The next few days we gave Ellery lots of grandparent attention, gave the dog attention and made sure he got out as needed. When Cassie wanted to see Ellery, Kurt came to take us to the hospital. 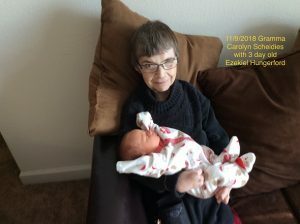 While Mom Cassie snuggled with Ellery, Keith and I got to hold our newest grandchild–Ezekiel. A quick trip, and of course, some items got left behind, but none of that mattered. We were with family and felt privileged to help out. Now I look into the faces of our grandchildren, see a new generation and feel hope. While the world is rocked by violence, we celebrated life with a new birth. This time of the year we also celebrate another special birth. With presents, family gatherings, decorations and more, we celebrate the birth of Christ Jesus. What better time to celebrate the birth of a child than at Christmas when we also celebrate He who brought and still brings healing, hope and love as we follow Him.